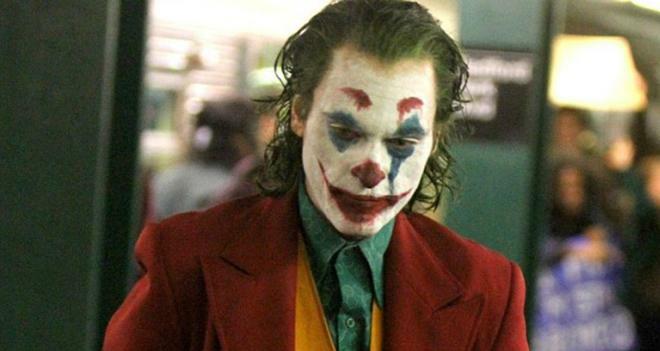 Warner Bros. has released the first teaser trailer for Joker, offering a peek at Joaquin Phoenix's creepy take on the iconic Batman villain. The film is set to hit theaters on October 4, 2019. A failed stand-up comedian is driven insane and becomes a psychopathic murderer. The movie stars Joaquin Phoenix as the title character, along with Zazie Beetz, Robert De Niro, Shea Whigham, Frances Conroy, and Brett Cullen. Todd Phillips (The Hangover) directs from a script he wrote with Scott Silver. Though based on the DC comic book character of the same name, Joker does not appear to be set in the same cinematic universe as Warner Brothers' other recent DC films like Man of Steel, Batman v Superman, Wonder Woman, Suicide Squad, Justice League, and Aquaman -- which already feature a different version of the Joker played by Jared Leto. Likewise, while the movie is set in Gotham and the Wayne family is featured in the film, the character of Batman is not expected to make an appearance. Other upcoming DC films include David F. Sandberg's Shazam! which will premiere on April 5, 2019, Cathy Yan's Birds of Prey (And the Fantabulous Emancipation of One Harley Quinn) which will premiere on February 7, 2020, and Patty Jenkins' Wonder Woman 1984 which will premiere on June 5, 2020. Likewise, a Suicide Squad sequel/reboot from writer/director James Gunn, an Aquaman sequel, a new Batman film, and a Flash movie are also all in development.